We were blessed for so many opportunities to help during our recent trip to Nepal and India — including the Asia for Animals conference and visiting many animal shelters. Help Animals India, an Asia for Animals sponsor, invited several of our partner group representatives to attend and speak, providing an opportunity to learn the latest work in Asia animal welfare and plan for future projects. Being a major conference with government official attendees, progress for Asian animals was made on many fronts. Help Animals India representatives at Kathmandu Asia for Animals conference. From L to R: Dr. Akshay Prakash of Sarvodaya Vets; Mr. Rinchen Lhaze of TVA (Tibetan Volunteers for Animals); Dr. Sashanka Dutta of JBF (Just Be Friendly); Ms. Eileen Weintraub of Help Animals India; Mr. Praveen Ohal of HOPE and Animals/Varanasi for Animals; Dr. Smriti Dutta of JBF; Ms. Jessika Ava of Help Animals India/FARM; Ani Janchub Zangmo of Sarnath Animal Welfare. 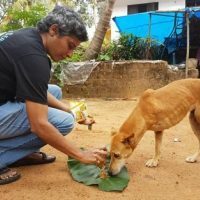 The Help Animals India board did six shelter visits, ascertaining areas in need of support. These shelters home animals who have no where else to go, from bears, monkeys, dogs, cats, cows, buffaloes, camels, horses, and more! All the rescued beings were wonderful to meet. So many animals, particularly disabled animals need more love and support. Our heart broke to see their plight, but the shelters we support provide a ray of hope, as the animals receive lifetime care. We were lucky to spend time with one of the sweetest rescued elephants, 55 year old Aneesha, a victim of the logging and temple industries. Her legs are permanently damaged due to years of hard labor. Thanks to our donor support, Aneehsa is now living a nice life in sanctuary. PFA Chennai continues to do outstanding work to rescue cows and buffalos from slaughter and cats from the horrific cat meat trade. 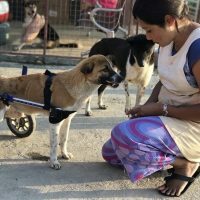 They also provide a life long home to injured street dogs, abandoned working equines, goats rescued from slaughter, and any other needy animal who crosses their path. 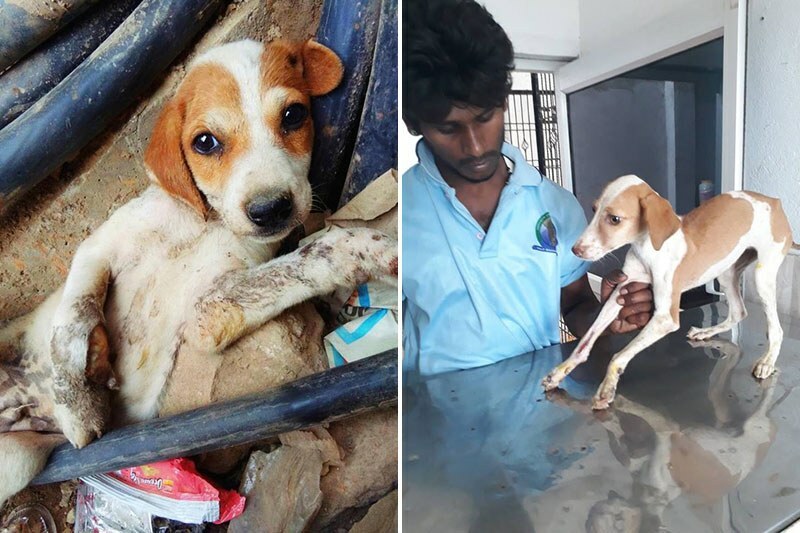 Thanks to your donations, we've been able to provide PFA Chennai with a new, much-needed animal ambulance to rescued animals from the street and food for the shelter animals. Dr. Shiranee Pereira, the Director, has also been instrumental against animal testing throughout India. This sweet short video is a MUST WATCH look at the Red Hills sanctuary, please visit along with us! it is a rare opportunity to see Dr. Shiranee at her work in this chain free/cage free idyllic shelter . The volunteer who did the video had to plead with Dr. Shiranee to be in the video as she wants the focus to be on the animals and not her but when it comes to helping so many animals she has the strongest force of will. 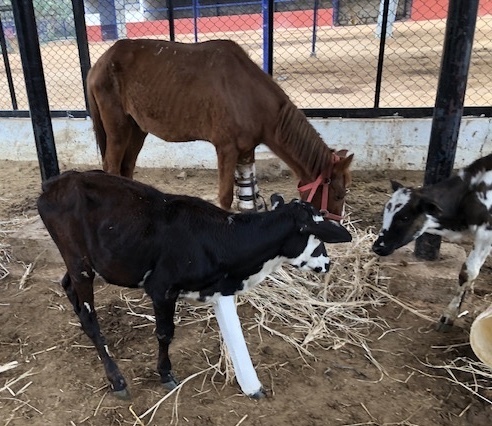 With seven centers throughout Bangalore, animals are brought in daily, including former working horses with shocking injuries suffered after abandoned to the street. As we can't return these animals to the street, they need lifetime care at the shelter. And we are happy to fund the second CUPA 100 Cat Spay/Neuter Project, that also educates the community to care for street and pet cats. Karuna Society For Animals and Nature in Puttapathi is inspiring us all by building a new 18 acre wildlife rescue center. Think of the impact it will make for generations as there is no other protection for these wild animals in this part of South India. 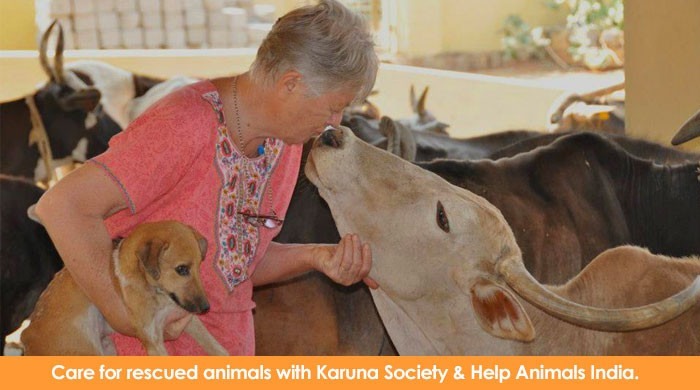 Karuna's other shelters are also incredible places for all animals. And furthermore, Karuna grows organic produce to sell to local people and provide an income for the shelters. "Cherry" before and after at Varanasi for Animals. The VFA clinic is improving with the addition of more kennels, staff training, and more street animal spay/neuter operations to stop suffering at the root. With animal birth control, Mom dogs appreciate this greatly, as well as local people who don't have to see so many injured puppies on the street. 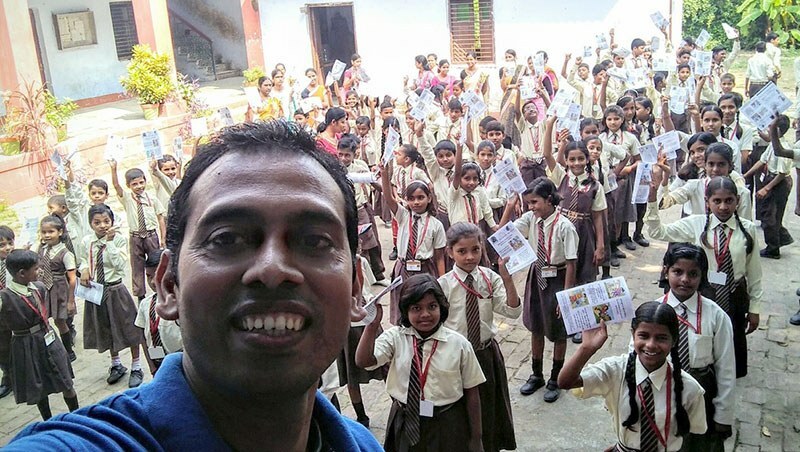 Dr. Akshay showing off his "selfie" skills and his talents making educatng about kindness to dogs fun to Sarnath children. In Sarnath we sponsored the fifth annual animal birth control and educational camps. The Sarnath project has been an immense success in not only reducing the dog population, but also completing transforming society to be more kind towards animals. 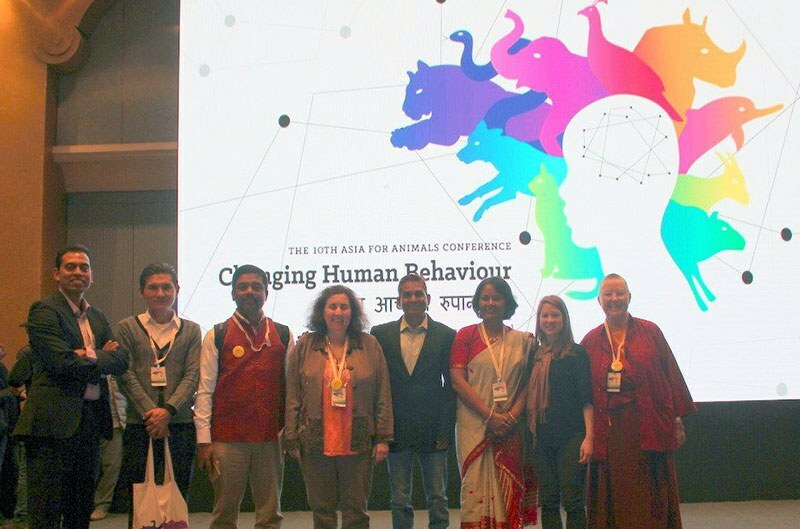 Here is the Senior Vet, Dr. Akshay Prakash and Help Animals India Advisory member, describing the Sarnath project success at the Asia for Animals conference presentation. Thank you to all once again who contributed to our year end funding. We can't thank you enough! You may have seen recent "matching" fund pleas but please remember your donation from the USA/Canada/Australia/Europe is increased many times over when sent to help animals in India as 64 Indian Rupees to the dollar or 100 Nepal Rupees goes very far to help many more animals. And since it's only because of YOU that these projects are happening, we hope you remember all the animals who need help year-round. Unfortunately donations tend to stop during this time of year, but of course, our care to animals cannot stop! So please help us keep the regular care our animals need, the animals rely on you! And please consider a monthly recurring online donation. This helps us to plan our year-long project, knowing the animals can count on your help. 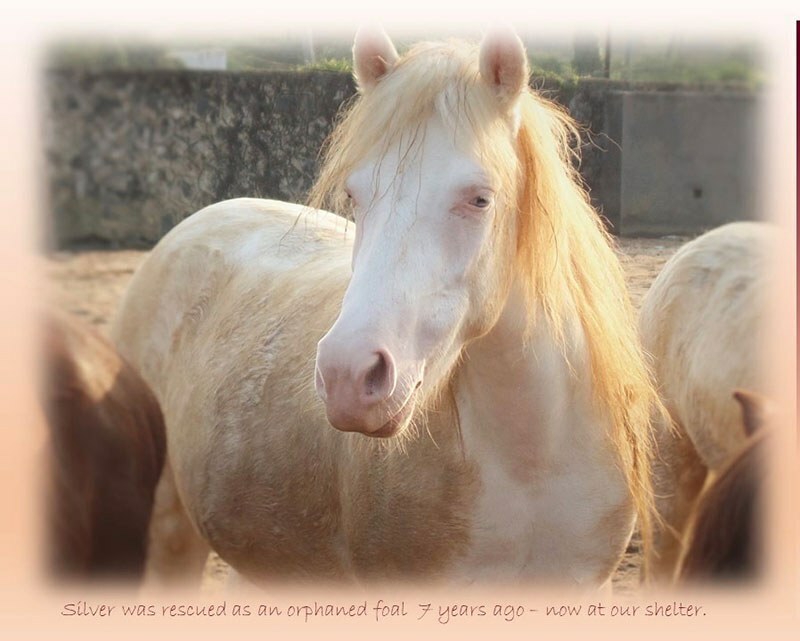 With love from Help Animals India — on behalf of India and Nepal's animals!